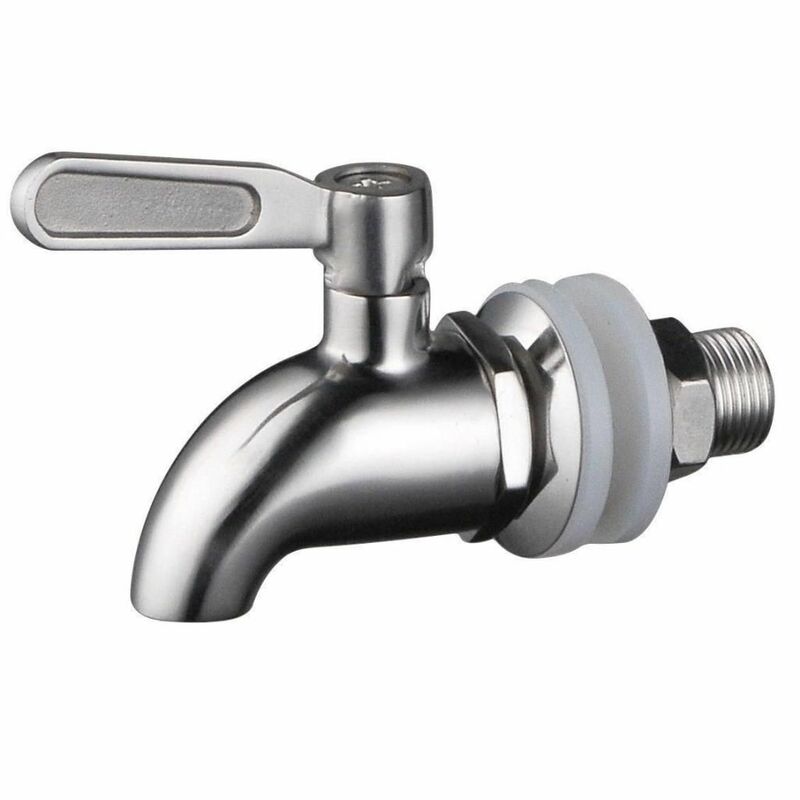 100% Wood Spigot included in price, upgrade to Brew Safe Stainless Steel for style and improved flow if desired. Enjoy the mellow flavor of an American Made Handcrafted Toasted White Oak Barrel aged Kombucha at home. The oak provides the Kombucha bacteria and yeast a unique home and the culture literally grows right into the sides of the barrel. 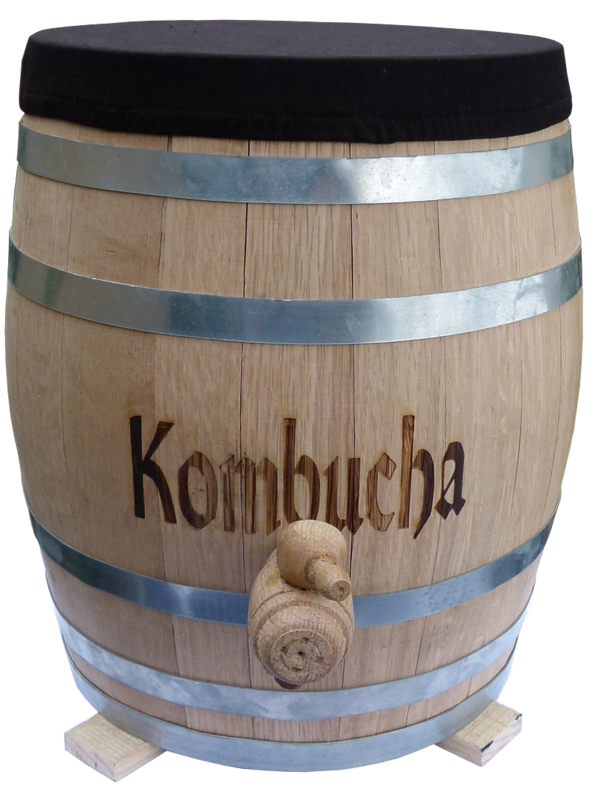 Lovely to look at and full of flavor, your own homebrewed oak barrel Kombucha will delight all who savor it. Not only is this a lovely home for your Kombucha but it is made in the USA with all natural materials - no plastic! You can rest assured that your purchase supports your friends and neighbors here in the US. Plus you can put your mind at ease that with the wooden spigot and all wood construction, there aren't any harmful chemicals that could potentially leach into your Kombucha! The oak provides tannins (also found in tea) that nourish the Kombucha culture yet mellow the acetic flavor. Barrels have a medium char and include a wooden spigot and spigot brush. 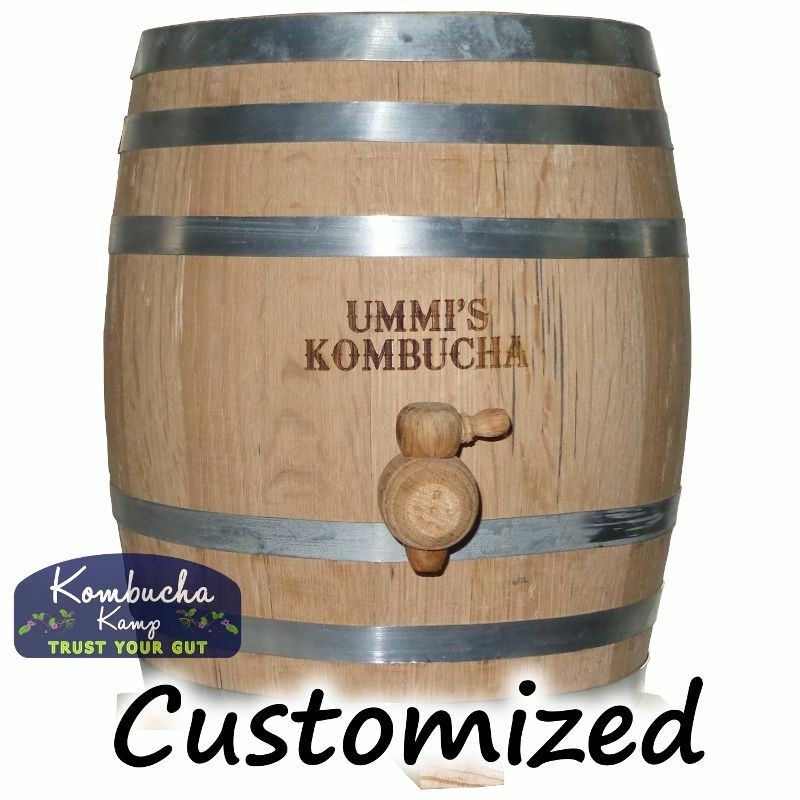 Choose from Plain or with KOMBUCHA inscribed on the front. Customize the inscription for only $5 more! i.e. "Rob's Brew" "Crumbucha", "Sally's Kombucha", etc. to any Continuous Brew Package! 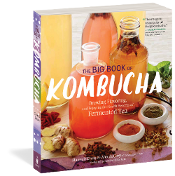 The BRAND NEW Book from Kombucha Kamp features 400 pages packed with 400+ receipes and everything a new or experienced brewer needs to find success! Never before has a book so comprehensive been published on this topic, and you can add it to your package for a discounted price today! Add your copy by choosing from the drop down menu above. Oak Barrel brewing is a joy for the palate as well as the eye. 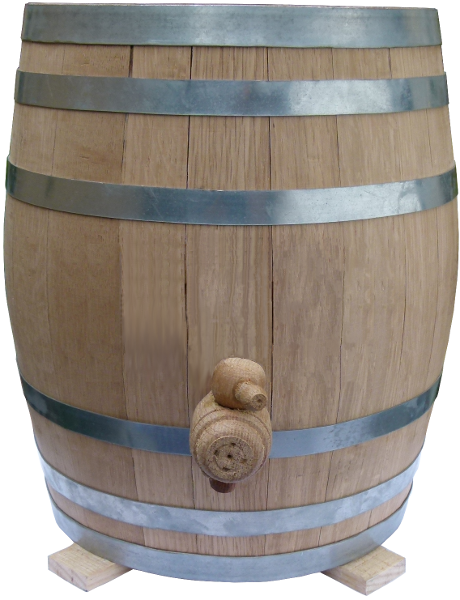 Over time, the barrel will achieve a unique, "worn in" look similar to that of barrels found in wineries or distilleries. This natural aging process is part of its rustic charm. The spigot is installed about 40% up the barrel to prevent overdraining. Barrels have been in use since before 350 BC and were likely designed by the Celts borrowing wood bending techniques from boat building. Traditionally used for fermenting all kinds of foods from pickles to wine to vinegar and tabasco sauce. 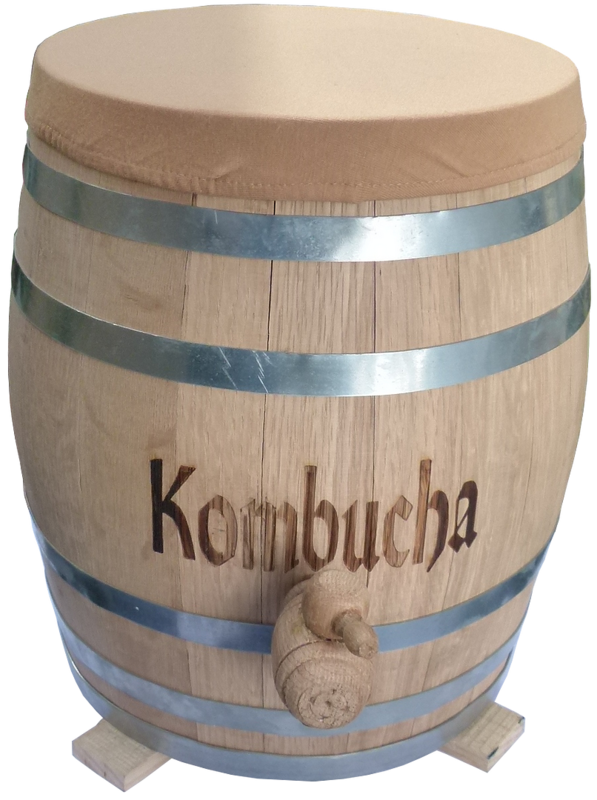 Continue the ancient practice of fermenting in wood with a Kombucha Kamp Barrel. I bought the oak barrel, the stainless steel spigot and the pro heater and could not be more pleased with our purchase. We've been enjoying kombucha regularly since early July (2018) and it just keeps getting better. The oak barrel arrived after about a week and we put it right to work, not a leak or any unhappiness at all although my machinist husband did remove a burr from the inside of the stainless steel spigot but that is nothing that affects the usefulness of the product. 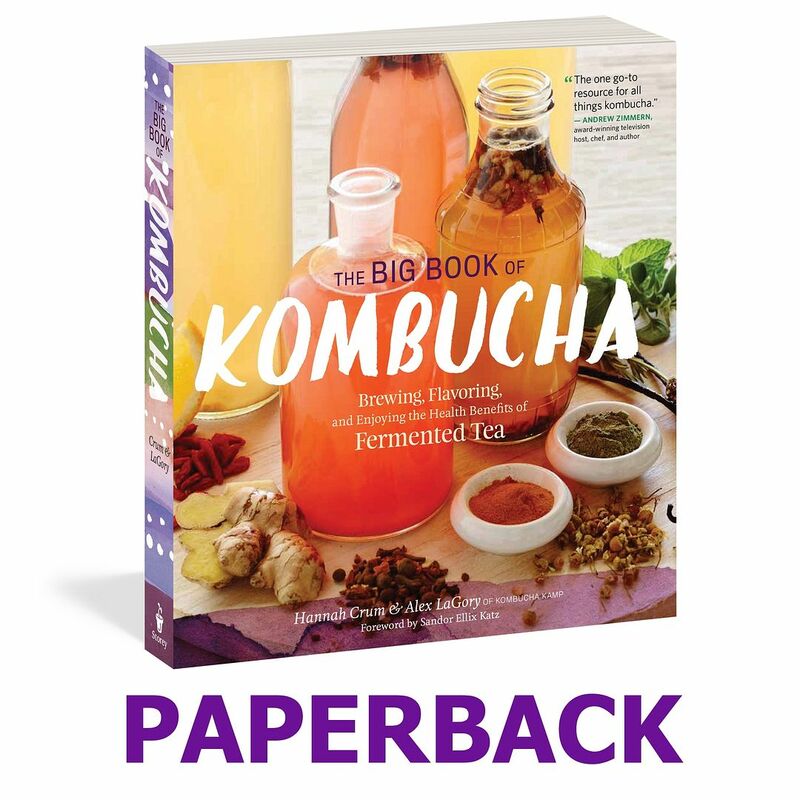 I highly recommend the Big Book of Kombucha as a reference guide and am grateful to Kombucha Kamp for promoting fermented foods and a healthy lifestyle. I love the wooden 5 gallon barrel! The Kombucha has gotten to a great place for our taste. This beautiful 5 gallon brewer has lived up to the rave reviews. 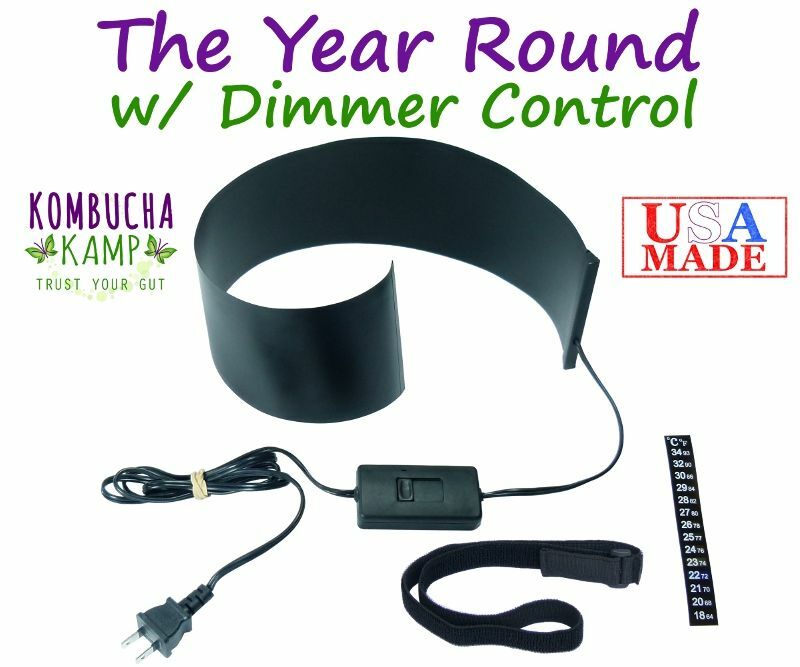 It's beautifully-made without glue or nails, and it worked perfectly from day one...no leaks, easy directions for prepping the brewer, and delicious kombucha on my first try. I didn't buy the warmer and instead retrofitted my seedling mat, but it doesn't work as well since it doesn't wrap the whole way around. I keep a fleece over the whole thing and it seems to keep the brew at a good temp, but I live in a cold climate so I will definitely be investing in Hannah's custom fit wrap-around heater. The booch is delish....I bring lots in for co-workers who can't get enough. Thanks Hannah and your team for your high standards and continuous support! Everything about this company is amazing. I actually have never had this good of customer support. It has been so inspiring we have changed my own company's customer support. Thank you to everybody on the team! I give my highest recommendation and my highest review. And I absolutely love my 5 gallon Jun brewing kit! Very happy with my purchase of an oak barrel brewing system. I'd been using 1-gallon sun tea jars with plastic spigots. These were not efficient and clogged frequently. Upgraded the oak barrel to include a stainless steel spigot, which works fantastically. The cloth cap is great for keeping the brew safe from attack by unwanted pests. 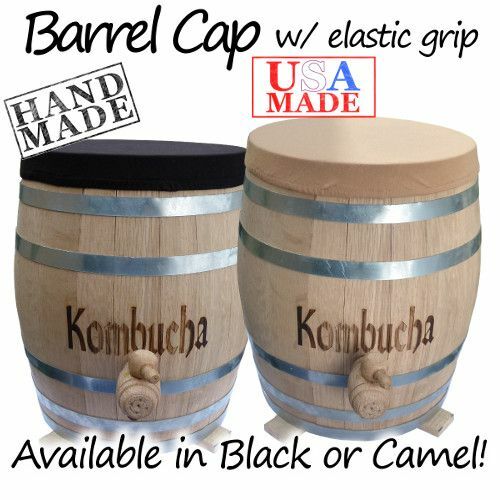 The barrel produces kombucha with a wonderful subtle oak flavor! I've been making kombucha for several years, fermenting it in three large Pyrex bowls occupying a significant portion of my countertop. I first read of continuous brew kombucha on the Kombucha Kamp website and knew immediately this was the next stage on my kombucha journey. 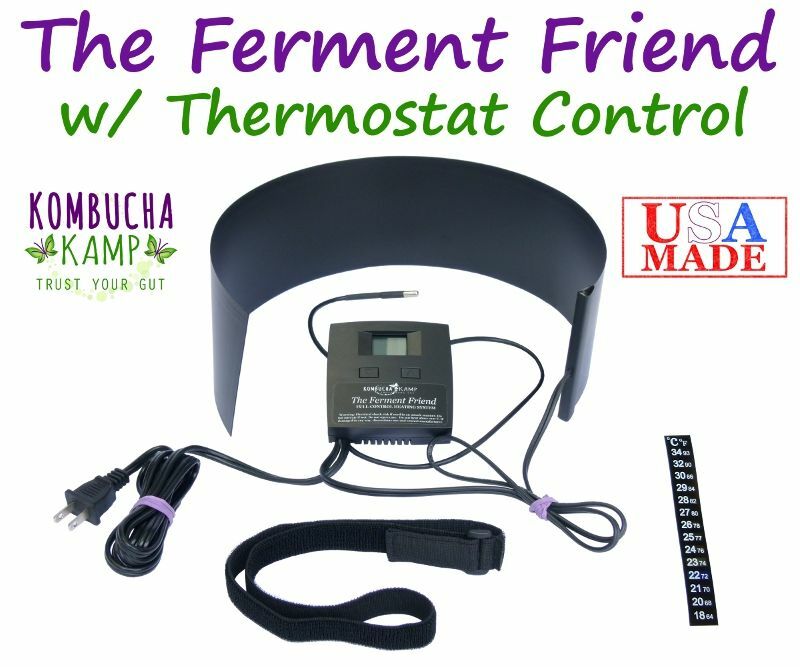 With continuous brew, I can make significantly more nutritious kombucha with significantly less effort! And far less countertop space! When I reviewed my options for a continuous brew vessel, I was drawn to the charred oak keg: 1) I like its rustic simplicity. 2) I love the idea that my SCOBYs would grow into the wood itself, melding organically with the keg rather than simply living inside it. 3) Wood in any form is beautiful to me. 4) Finally, the charred oak keg is a way of offering my kombucha a new and unique dimension in flavor. Wineries use charred oak kegs for their precious wine. Could I offer my precious home brew any less? The charred oak was a perfect choice for me. At certain stages of the fermentation, the wonderful charred oak flavor (indescribable) is more evident than in other stages, but it is never over-powering. At other stages, I don't taste the charred oak at all, I just feel its mellow richness in my brew. Sometimes I simply inhale the exquisite charred oak-kombucha fragrance rising through the top of my keg as my SCOBYs perform their healthy healing alchemy. I care not only about securing resources that I need but about supporting people and companies that care about people and about making a difference in the world, like Hannah and Kombucha Kamp. I've never had more responsive customer service from any company. People and their health clearly matter to Hannah; it shows in the customer service and in the high quality products. Supporting a company like Kombucha Kamp through my purchases deepens my pleasure in the process: my rightful purchases, Hannah's right livelihood. Hannah and Kombucha Kamp have resourced me with a wonderful new method for brewing a healing drink I expect to be savoring for the rest of my life. And with secondary fermentation, I can vary the flavors and health benefits by using flowers, fruits and herbs, giving me endless variety in my kombucha. I am grateful to you, Hannah. I got this 5-gallon barrel as a birthday gift for my son. His family of four all loves KT, so they really needed 5 gallons! They are loving it! They got it set up easily and have decanted their first "batch." I was able to taste it a day or two before they decanted, and even though we've both been using the same tea (Hannah's Special Blend), there was something different about the brew from the oak barrel-- a certain mellowness that was really delish. I was concerned that a 5 gallon barrel would be huge and overtake their small kitchen--but it doesn't at all.....It has a small footprint and sits beautifully on the edge of their counter where everyone has easy access to the tap. Their kids love Kombucha! I'm happy with my new porcelain brewer, but am thinking one day I may want an oak barrel myself! I give my 5 gallon oak barrel and the Kombutcha in it 5 smiling kitty cat icons with hearts for eyes. And Hannah, I appreciate you returning my calls and answering my questions and taking my order. This oak barrel is like a classic work of art, it's tasteful appearance brings happiness to my heart,. Just as importantly, it is enhancing my Kombucha brew in a subtle and delicious way. My experience with customer service was warm and helpful. Thank you! Excellent customer service!!! I had a "bad" initial experience, but notice I didn't remove a star - they made it right in every way. They are the company you WANT to do business with. My first barrel molded because I misunderstood the part of the directions that said "may leak for up to 5 days during initial soak." DO NOT SOAK for more than 24 hours before you start your tea!! Hanna explained that the sugars in the barrel feed mold after 24 hours. Also, my first barrel was totally burned and the box full of ash. That's not what you want to see - it should be "toasted" not burned. BUT, 5 STAR RATING for my whole experience - they replaced the barrel and gave me all the support and answered all my "stupid" questions. And, I've had stellar SUCCESS ever since!! The new barrel was not burned - no ash in the box - and was lovely. It didn't leak at all (like the first one did). And, I just pulled our first DELICOUS gallon - WOW! We've been doing single batch in a glass contrainer for a long time, and the taste just doesn't compare. You have to try this! You WILL be more than satisfied, there's NO RISK! Try it, you'll love it. THANK YOU KK!!! Thanks Hannah! What an awesome investment this has been. Initial brew took two weeks but I'll be bottling today. QUALITY product! I can't wait for the kombucha to be ready! Without your excellent instructions and videos and ingredients, I doubt I would have ever had the courage to try making kombucha, and certainly not continuous brew. I absolutely LOVE my Oak Barrel. I began brewing Kombucha in Dec of 2013. 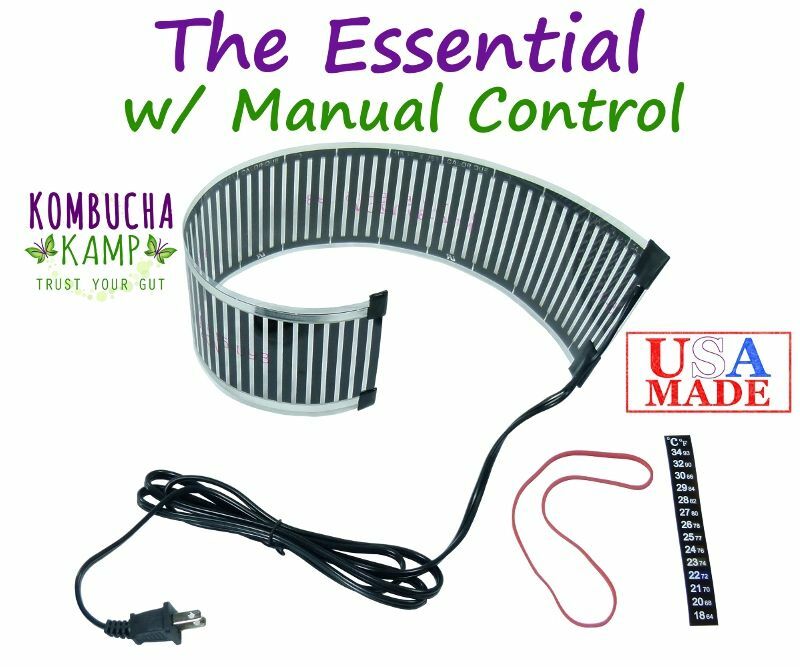 I purchased a porcelain continuous brew system from Kombucha Kamp. I really like the porcelain system and still use it. However, our family went out of town and stopped by a big grocery store. My husband decided to try some different store bought Kombuchas. In doing so he requested that I let our home brew Kombucha brew longer and get a little more tangy and less sweet. I told him that we would need to get a bigger brewing vessel to do this. So I bit the bullet and bought the 5 gallon oak barrel. I had been eying it since I purchased my first brew system. I do consider myself lucky in dealing with you and your company; that you care and take the time to help resolve issues. Thanks for working with me. My husband ordered the 2.5 gallon with custom engraving.We haven't yet began to use it just yet,as we're moving soon, but it looks wonderful.The wood slats have no gaps.The barrel is extremely well made.It also arrived in a very timely manner and we'll packed.Can't wait to use it.Thank you KombuchaKamp. Thank you for your speedy and thorough response. I appreciate your customer service. It has been hard to believe the run around answers I have received to my questions from other online barrel sellers. Just when I am losing faith in the honesty of human kind, along comes great folks like you. I will definitely being order from you. I am a recent graduate living on a fellowship stipend so it will take me some time to save up for the barrel. You WILL be seeing my order come through one day though. I love this barrel . It is beautiful and well made . Be sure and have it personalized ! KK makes it easy ! I am beyond in love with my barrel! Not only does it add another great rustic touch to my kitchen, but the functionality of a continuous brew system is exactly what I needed. I also really like the fact that it was made the in USA. You will not be disappointed with this purchase!!! We are so in love with our Barrel. We are still waiting for our first batch but the shipping went very well all the way here. Also, the personalized service KK has given us is priceless. It has make us feel like more secure about the whole process. Can't wait for our first batch!! I think we will end up buying another one in the very near future. tea since a very young age. I feel in love with Kombucha and began brewing a continuous batch, but needed a bigger brew vessel and ordered the toasted oak barrel and it works great and looks great. I also get a hint of the toasted oak which I enjoy. The barrel was originally shipped to me without a spigot. I email Hannah and within one day I had a spigot - great customer service. I also received another spigot from the manufactuter! The barrel works great, but the initial curing of the barrel left stains from the water leaking through the seams of the barrel when curing. If it is possible maybe you would want to somehow submerge the barrel in water to cure. 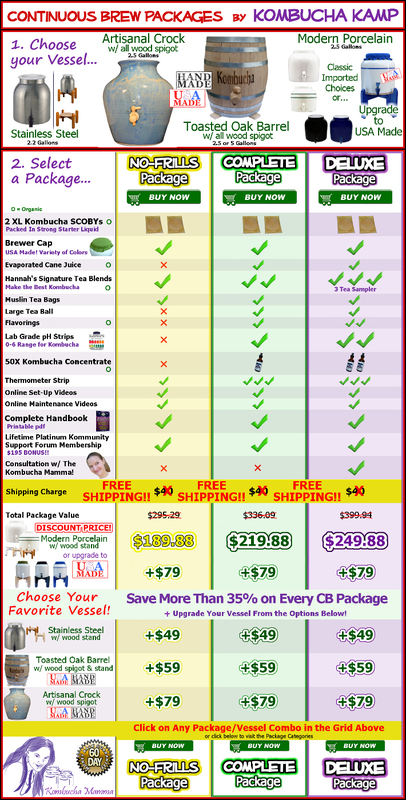 So far, I really like and enjoy the Kombucha expereince. This barrel is absolutely beautiful in every way! Both the smell of the barrel as well as the taste of the brew that is made reminds me of some of my favorite craft beer flavors. Sort of a vanilla, cocoa, and woody taste that compliments my kombucha tea very well. I can already see evidence of the scoby actually growing into the wood itself and becoming integrated within the vessel. One of my favorite things is what a bold statement it makes on my kitchen counter... The oak is beautiful and the wood spigot is really unique. The barrel came "pre-hydrated" according to the instructions and as a result, it only took about an hour after filling it with water and vinegar as instructured for the leaking to stop. Thank you for offering this barrel! I look forward to purchasing more in the future!! I love my oak barrel! 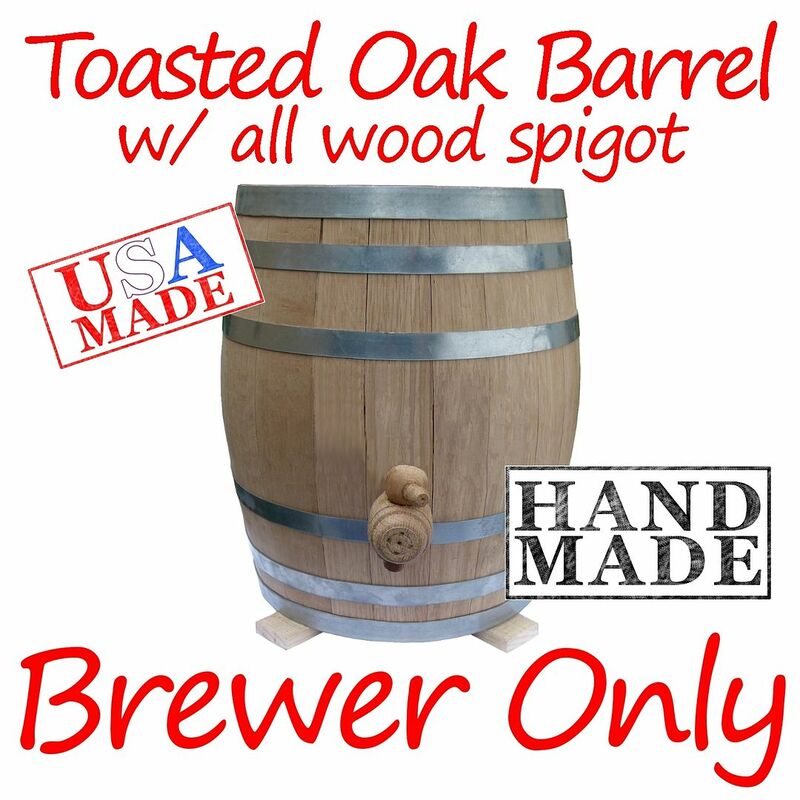 I wanted a continuous brewing vessel that was made in the USA and I really liked that even the spigot was wood. It is beautiful. I already loved Hannah's tea blend, and together the taste and convenience are awesome! I love my oak barrel. It is beautiful, functional, and well-crafted. I may have to order a second one soon! I LOVE MY BARREL!!!! I just tasted my first brew and the taste is hard to describe... it's kind of a toasty, mellow woody goodness! I made it with Hannah's Blend and the combo of both is, simply put, AMAZING! The barrel itself is beautiful! The personalization makes it truly unique - "Ummi's Kombucha". My grandchildren will love it when they come. I have only two complaints regarding this purchase: 1. It took 12 days to get here, but that was because I had it personalized. I can tell you though, it was worth the wait!! 2. The spigot is hard to turn especially with my sore fingers. I hope that with use, it will loosen up some. I almost lost some booch, but managed to get it turned off before I did. So as you can see, the only complaints I have, are acceptable. Thank you KK for my beautiful barrel. If you're thinking about buying one, do it! I know you will love it and the new flavor it brings to your KT!